I was so excited to receive my package from Stauer. Even more surprised to see the workmanship and quality of the ring. It was beautiful and it made my day. Buy it you won't regret it. Love it!!!!!! I bought this ring about 2 weeks ago and I was very glad that I did. The ring is of unusual construction and it's very beautiful. The lacy gold band is also very flexible which is helpful for fit/sizing purposes. I think you will love this ring if you purchase it! Hello! Thank you for the opportunity to express my feelings about this garnet ring. Honestly, when I saw it in the catalog, I was overwhelmed;however, when I received it, I didn't realize that it was an expandable ring and I was a bit disappointed. I normally order a size 6.25 and the size I received seems a bit loose. But!!! The color of the stone is totally gorgeous. I wear it but I haven't received any comments one way, or the other. It truly is different than any other garnet I wear and I do love garnet! This ring is so comfortable and I love that it's able to stretch to different sizes, helps when you want to wear it on different fingers. Would definitely recommend to anyone looking for an interesting piece of jewelry. My sister bought this ring and after seeing it, I fell in love with it. The stretch band is so unique. I've only worn it once, but I plan on wearing it anytime the occasion arises! I didn't expect this ring to be as flexible as it was when I ordered it, but I'm glad it is. It might look a bit flashy in the picture, but it's very much an everyday ring that I enjoy wearing. Plus, the band is adaptable, so I can put it on whatever finger I like. Overall, it's a simple ring that I plan on wearing everyday. I fell in love with this ring but waited to order for a month....not sure why because I love this ring! The stretch is amazing so if I eat salt it still fits. The band is so striking and the garnet is just the right touch. Now if they had one is emerald or sapphire! ! ! THIS RING IS FANTASTIC. IT IS SO BEAUTIFUL. IT IS ALSO FOR MEN OR WOMEN. MY BIRTHSTONE IS RUBY. THIS IS MY BIRTHDAY PRESENT TO MYSELF. I WILL BE 70 IN JULY. I LOVE THE RING. EVERYONE LOVES THE RING. I CAN WEAR IT ON ANY FINGER. AS IT EXPANDS. THANK YOU SO MUCH FOR A WONDERFUL RING. I received this ring today. It's absolutely beautiful! So intriguing and light, very comfortable, don't even feel it on my finger.The photo does it no justice,,,I can't stop looking at it. I'm so happy with my new ring! The setting of the beautiful garnet makes it glow. The ring itself adjusts to the ever changing size of my finger. Also I can wear it on either hand. So the designers have created a winner. I look forward to obtaining the bracelet and necklace to match. Very pretty. Did order smallest size hoping I could wear it on my little finger. However it stretches too much and wear it on my ring finger instead. I normally wear a 5 on little finger and a 6 on ring finger. But still like it!! The ultimate Italian indulgence... 14K gold garnet ring made in Italy for just $149! Now that's amore! 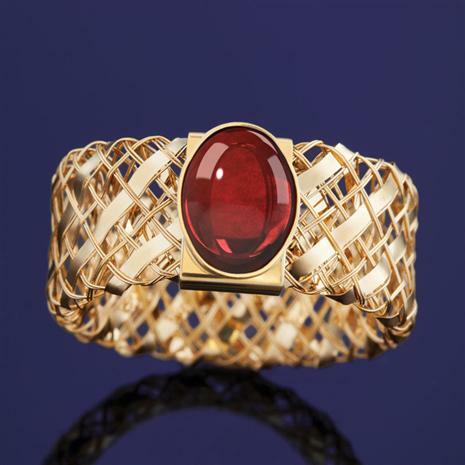 Italian gold artistry has a rich history that stretches back 2,000 years. The Italian hill town of Arezzo is one of the most important manufacturing centers in the world for gold jewelry. It is also arguably the most creative and innovative locale where jewelry is made with the artistry and craftsmanship that are the hallmarks of Italian jewelry design. So, naturally that’s where we went to seek out the best artisans on earth to create our Via di Oro Ring. We found her. Fiorella Cappelli works from her studio in the heart of Arezzo’s jewelry district, where she rubs elbows with the world’s biggest jewelry names. One of the things she does particularly well, and what has been branded Glam Flex Gold is her talent of treating gold like fabric. Fiorella creates designs using finely woven gold mesh, in threads that in some cases are half the thickness of a silken thread. She has shaped and coaxed precious gold into an intricate ring that has the magical ability to stretch an entire ring size. Then to top it off, she’s added a perfect oval cut red garnet, a gemstone treasured by nobility since biblical times. To possess a solid gold ring with a genuine gemstone handcrafted in Arezzo is an expensive venture. However, at Stauer we’ve made it our mission to make the extraordinary affordable.